RocTopple 1. 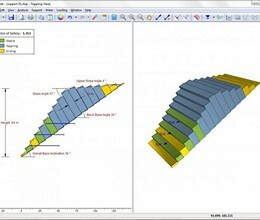 0 is an interactive software tool for performing toppling analysis and support design of rock slopes. The analysis is based on the popular block toppling method of Goodman and Bray first published in a paper, Toppling of Rock Slopes, in 1976. Input the slope parameters, discontinuity spacing, dip angle and strength, and RocTopple automatically generates the toppling blocks. RocTopple makes it easy to visualize the slope failure in 2D and interactive 3D, and displays the potential failure mode of individual blocks (toppling, sliding, stable) as well as the overall safety factor. In addition to deterministic analysis, RocTopple features probabilistic and sensitivity analysis options. Probabilistic analysis allows you to define statistical distributions for any combination of input variables. A probability of failure is calculated, and results can be plotted as histograms, scatter plots and cumulative plots. Sensitivity analysis allows you to determine the effect of individual variables on the results. Support can be modeled using rock bolts with user defined length, angle, capacity, spacing and location. A variety of external loading types can be applied, including line loads, distributed loads, seismic load and water pressure. RocTopple implements Eurocode 7 design standards, which allows you to define partial safety factors for different components of the analysis. 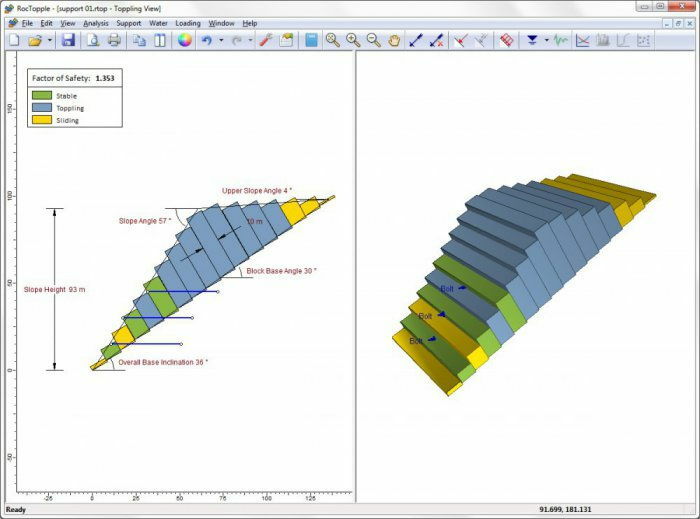 RocTopple rounds out our suite of rock slope stability software, which also includes Swedge, RocPlane and Dips. * RocTopple download link provides trial version of the software. No one has rated RocTopple yet. Be the first to rate this product.